As per the weekly Charts the stock seems to be on a major breakout. Could become a leader for the Index. 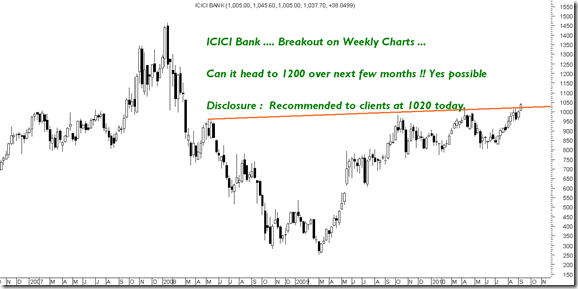 You glad to know that before your analysis i already analysis of icici bank when it near 1000 that this stock will move to 1090-1150-1210. Here is my statement. hi nooresh as per my analysis strong breakout is seen only above 1050 and i see 1250 above 1050 for medium term …as of now icici bank trading below breakout level of 1050 and hence its not a breakout yet….. pl comment on my analysis….